Today’s companies need approaches to analytics that are both faster and smarter than ever before. Faster, because business users can no longer afford to wait days or weeks to get questions answered by overloaded technical analysts. And smarter, because it’s no longer sufficient to only report what happened when. Augmented analytics help users understand why activities are occurring, and how to make the right adjustments moving forward. Artificial intelligence is improving our personal and professional lives. Learn some of the key milestones and concepts of AI and machine learning, and find out what's on the horizon. For CPGs and grocers, the challenge isn’t capturing consumer and product data - it’s learning how to pull out meaningful insights that can improve their bottom line. In this follow-up to "How CPGs Can Use AI to Find Growth," we take a technical look at the advances in artificial intelligence and machine learning that are helping those in consumer insights, brand management, marketing, and more. If you’re tired of spending 30 minutes to answer simple questions using POS and syndicated data, learn how to leverage the latest advances in artificial intelligence to get targeted insights in seconds. Hint: Think Siri or Google search to get answers and insights from your own data. 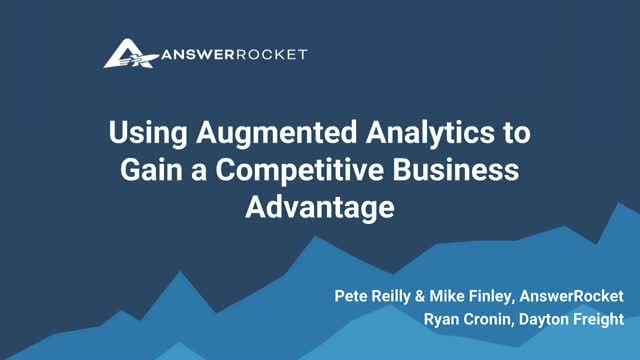 Also, hear how one of the largest CPG companies in the world is finding new growth opportunities through augmented analytics. AnswerRocket is a search-based data discovery analytics tool using natural language, designed for the business user. Instead of waiting days or weeks for technical gurus to fulfill analytics requests, AnswerRocket users can ask questions using everyday language and get visualizations in seconds. This speeds up their ability to make business decisions and positively impact their bottom line.